“Pierrier in The Old Switcheroo!” by Mark Martin. 6 pages. “Fifteen Years Later” by A.C. Farley and Richmond Lewis. 3 pages. 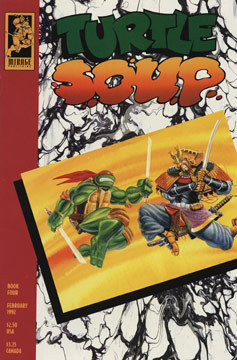 “TMNT Attack!” Part 4 of 4 by Michael Dooney and Steve Lavigne. 6 pages. “Teenage Mutant Ninja Turtle” by Mark Thibodeaux, Jack Kirby and Guy Romano. 7 pages. “Failed Instant ” by Michael Zulli, Steve Murphy, Steve Lavigne and Rob Caswell. 5 pages. “Thoughts on Paper” by Michael R. Gaydos and Dan Berger. 5 pages.